Beall Barclay & Company, PLC is pleased to announce Chris Brown has been named the 2017 Outstanding Emerging CPA by the Arkansas Society of CPAs. Brown was recognized during the Society’s annual Awards Reception in Little Rock earlier this month. 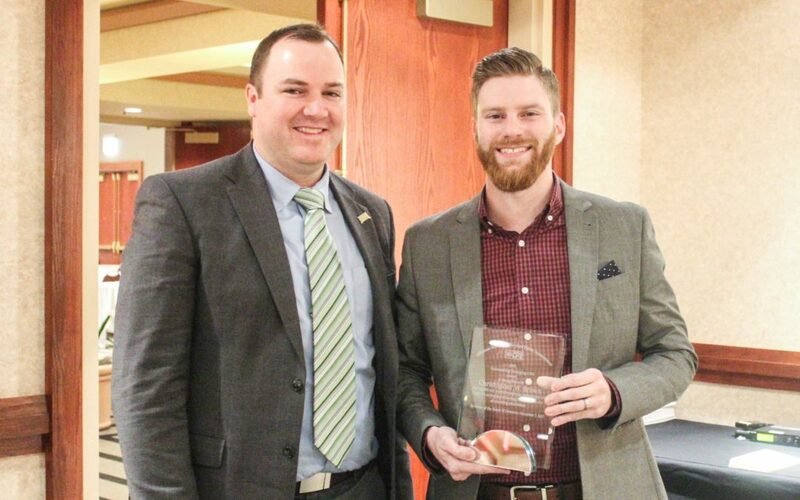 The Outstanding Emerging CPA recognizes a new CPA who has made significant contributions to the accounting profession as well as the community at large. Chris has been with Beall Barclay since he began as full time tax season intern during his senior year of college in 2010. After graduating Arkansas Tech University, he became a staff accountant and has climbed the ranks to audit supervisor within five years of being with the firm. During tax season, Chris focuses on serving clients with rural development HUD related audit requirements. For the remainder of the year, he serves many of the firm’s oil and gas, nonprofit and governmental clients. Chris is also heavily involved in Beall Barclay’s recruiting program and marketing team. Chris has been selected for the Northwest Arkansas Business Journal’s “Fast 15” list as well as Arkansas Business’ “20 in their 20s” list, both of which highlight a select group of twenty-somethings on the fast track to professional and personal success in Arkansas. He was also chosen to participate in Wolters Kluwer, CCH’s Emerging Leaders Program. This year, Chris has been featured on two accounting-related podcasts.